I actually picked up this recipe from GF's Mom. My sisters' have done grilled salmon before, but for some reason, they're never as crunchy as the ones from Ramen-kan. So here's the trick. 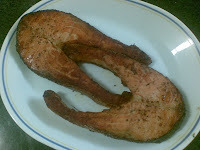 The secret is to pan-fry the salmon slabs, then grill it in the oven. If you get the timing right, it'll come out crunchy as pictured.